One Tam and Mill Valley Recreation are hosting a two-day celebration of Mt. Tam on Saturday, October 3 and Sunday, October 4. Come count raptors, learn about the history and ecology of Mt. 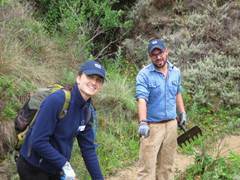 Tam, or get your hands dirty restoring the mountain’s habitats and trails at a variety of locations around Mt. Tam throughout the day. All events are free, but participation is limited and registration will be required. From 6 – 8 PM, join us at the Mill Valley Community Center for the opening reception for an exhibit of artwork from Tom Killion’s book, Tamalpais Walking. This reception kicks off a month-long exhibit of this work, brought to you by the Mill Valley Arts Commission and Mill Valley Recreation. The Mill Valley Community Center will be hopping from 10 AM – 2 PM with family-friendly fun featuring Mt. Tam-themed music, food, games, and crafts, as well as history, recreation, youth, and volunteer exhibitors. From 2 – 4 PM, join the leadership of the five Tamalpais Lands Collaborative (TLC) partner organizations for an interactive and engaging dialogue about the TLC and its One Tam initiative, what the collaborative has undertaken in its first year, and plans for the year ahead. More information about all of these events will be available at onetam.org starting in early August. We are excited to announce our first two One Tam staff members, Rosa Schneider and William Hough! Rosa and William will be helping all One Tam agency partners increase their ability to deliver youth, volunteer, and resource protection programs. Rosa is our new One Tam Restoration and Community Science Program Manager. She brings her extensive background in terrestrial and estuarine ecology and science education to help support community science and volunteer-based habitat restoration programs in priority sites on all agency lands across Mt. Tam. William, our new Community and Youth Program Manager, comes to us having done a broad range of work in ecological restoration and community-based conservation work. William will be bringing his talents to bear helping increase the capacity of One Tam agency partners to offer stewardship and resource education programs to community members of all ages, with a focus on underserved youth. 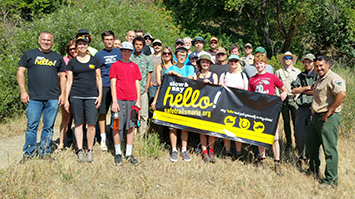 Roughly 100 people joined in the OneTam celebration of National Trails Day on June 6. 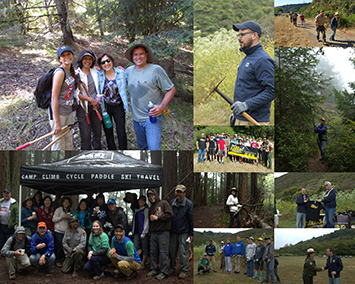 These trail enthusiasts helped support five different projects across the mountain, including the Shadyside and Berry Trails on Marin Municipal Water District land, the White Hill Trail and Sausalito-Mill Valley Path with Marin County Parks, the Coastal Trail at Bolinas Ridge with the National Park Service, and finally the Heather Cutoff Trail within Mount Tamalpais State Park. The day ended with a ranger-led hike in Muir Woods highlighting the benefits of trail work in sensitive habitats. Check out photos from the day on our Flickr page. Happy Trails! The Slow and Say Hello! campaign was also launched on National Trails Day. Created by the Trail Partners—a collaboration of the Marin County Bicycle Coalition, the Marin Horse Council, and the Marin Conservation League—the campaign aims to promote a safer, friendlier experience by asking that hikers, runners, bikers, and equestrians put themselves in the shoes of others, take time to exchange pleasantries, and help build a stronger sense of community out on the trail. 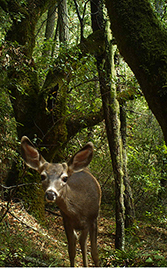 Email info@onetam.org with your best caption for this photo from the Mt. Tam Wildlife Picture Index . The winner will receive an unframed Michael Schwab Mt. Tam poster. One Tam is looking for four interns to join our team this fall. These internships will offer multi-disciplinary opportunities to work with California State Parks, the National Park Service, Marin Municipal Water District, Marin County Parks, and the Parks Conservancy. Youth and Community Program Interns will focus on engaging the local community by leading volunteers on work days, hosting school programs, and leading interpretive field walks. 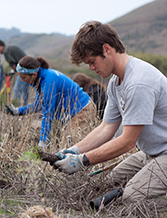 Restoration and Community Science Program Interns will focus on assisting and leading volunteer programs to restore habitats, maintain trails, and support community science programs, such as the Marin Wildlife Picture Index Project. Full descriptions and application information can be found here: http://www.onetam.org/internships. Check out this short feature film showcasing some of the stunning beauty of Mt. Tam filmed through the lens of filmmaker Gary Yost. We will be out and about in the community over the next couple of months at the following locations. Come by to learn more, get a trail map or window decal, or just to say hi! 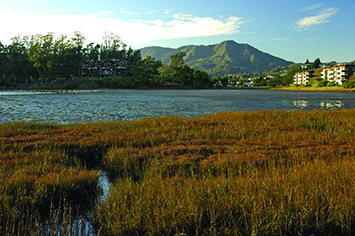 Marin Municipal Water District (MMWD) is hosting a free open house event on Saturday, June 27 from 10 AM - noon at 220 Tamal Vista Boulevard in Corte Madera. Come take a facility tour, ask questions about the drought, and learn how to read your water meter. There will also be an arts and crafts station for kids, and a chance to have your picture taken on some of MMWD’s heavy equipment while wearing the official MMWD safety vest and hardhat. You can also learn more about the plants, animals, and topography of Mt. Tam and upcoming volunteer stewardship opportunities.